The objective, non-invasive appraisal of ovarian follicular status using ultrasound scans is an invaluable parameter for understanding normal and pathological ovarian function. In assisted reproductive technologies (ART), it is undoubtedly the key element for determining follicle maturation and readiness for triggering ovulation. When performed on a routine basis, this status appraisal has long been restricted to the 2D, manual determination of follicle diameters because, in the past, follicle volume assessment had been unreliable, complex and time-consuming. Moreover, given that ovarian follicles often display intricate shapes which depart from the ideal sphere or ellipsoid, the manual determination of diameters only provides a pale reflection of true follicle volume - a phenomenon which can potentially misguide medical decisions. 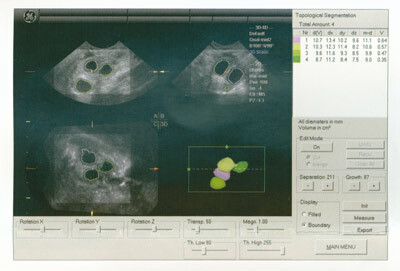 Another important clinical application for ovarian ultrasound scans in ART is the direct visualization and counting of small antral follicles. In combination with hormonal measurements, an antral follicle count using ultrasound scans has become an invaluable parameter in appraising ovarian follicle reserves. Yet exhaustive counting of such tiny ovarian structures (<7 mm) is often difficult and time intensive. 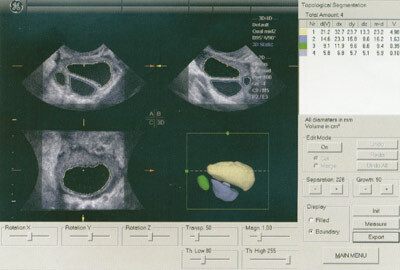 During the last decade, multiple refinements in transvaginal ultrasound transducers and signal-treatment software - in particular the development of Virtual Organ Computer-aided Analysis (VOCAL™) technology - has greatly improved both the accuracy and user-friendliness of 3D reconstructions of ovarian ultrasonographic images, thereby permitting the volumetric study of ovarian follicles. Indeed, data gathered so far even indicates that VOCAL1M-assisted assessment of follicle volume provides more reliable results than those obtained from the geometric extrapolation of 2D diameters. However, in order to determine follicle volume, and because of the often irregular shape of these anatomical structures, VOCAL™ technology requires that the inner follicle borders are outlined - a manual process that needs to be repeated 6 to 30 times (for every 30°, 15°, 9° or 6° angle of rotation) making the procedure time-consuming and operator-dependent. These constraints prevent the routine use of VOCAL™ technology during the monitoring of assisted reproductive treatments. In order to overcome these limitations, we became involved in c oping an innovative approach derived from topological segmentation technology, called Sonography-based Automated Volume Count, or SonoAVC™. This innovative module is an advance on VOCAL™ as it permits the automatic recognition of follicle borders, as well as 3D follicle reconstruction and follicle volume assessment (see figure) via a user-friendly interface. Our preliminary experiences with Sono SAVC™ indicate that this system is fast and simple to use in assessing preovulatory follicle volume, and at least as reproducible and reliable as VOCAL™ when met measurements are compared to the true follicular fluid volume - data which has recently been confirmed by others. These promising results suggest that the simplicity and accuracy of SonoAVC™ will hopefully prompt clinicians to shift from 2D to 3D measurements in their daily assessment of volumetric, irregular structures such as ovarian follicles. Finally, we are currently testing how SonoAVC™ can be used to identify and count small antral follicles, in an effort to render this important clinical parameter of ovarian reserve testing more reliable and operator-independent than conventional manual methodology.